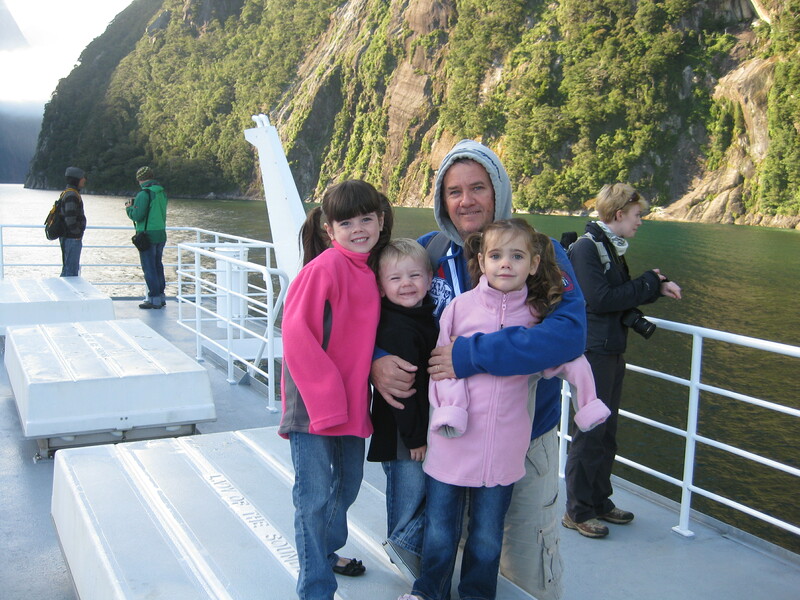 When we took the kids to New Zealand, Craig was very keen to take us all to Milford Sound. He had been before a few years back but the kids and I had not been there. Its a long drive from Queenstown to Milford Sound but one Craig thought was worth making. We had a hire car for the week while visiting friends, you can read about out road trip Christchurch to Wanaka and Wanaka to Queenstown that I posted recently. Its a 5 hour drive from Queenstown, we left our friends to return to Wanaka and we headed for Milford Sound. We had booked a cruise for the next morning and then returning to Wanaka ourselves, so we had set ourselves some pretty big goals for the 24 hours before meeting back up with our friends. Straight after our ride on the Shotover Jet, we left Queenstown at 4pm and drove straight to Te Anau and stopped for dinner. We had a very quick dinner and back in the car as there wasn’t much open at that time of night. It was a good opportunity for the kids to stretch their legs and go to the bathroom. We arrived after dark so I can’t tell you much about what the place looked like. The drive was long and luckily we had good conditions going into Milford Sound as we arrived at our accommodation after 10.30pm. There was a lot of wildlife on the road so it was pretty slow going for those last 70kms or so. Luckily the kids were still young so they had gone off to sleep in the back. 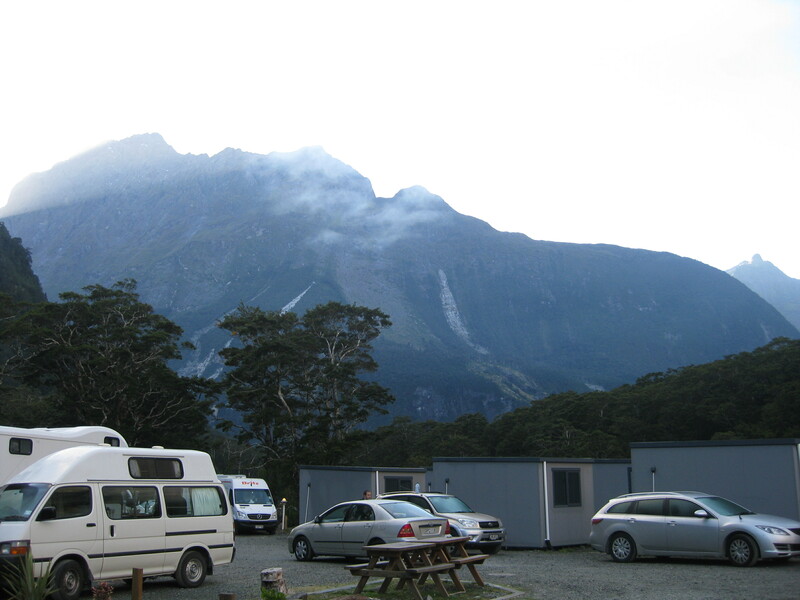 There’s not a lot of choice for accommodation at Milford Sound, there’s a 5 star hotel and a backpackers. We arrived late and were up at 6:30am for the Milford Sound Boat Experience so I was not too concerned about our accommodation. The cheapest option was to hire a dorm for all of us. The kids thought it was pretty special. On that particular night they were the only kids in the hostel. We were all exhausted from the long drive so we all went straight to bed, the alarm was set for 6.30am. This is what I woke up to after arriving after dark. We were lucky enough to have a car a be able to self drive to Milford Sound. This is the best way to do it if you want to do a morning cruise on Milford Sound. 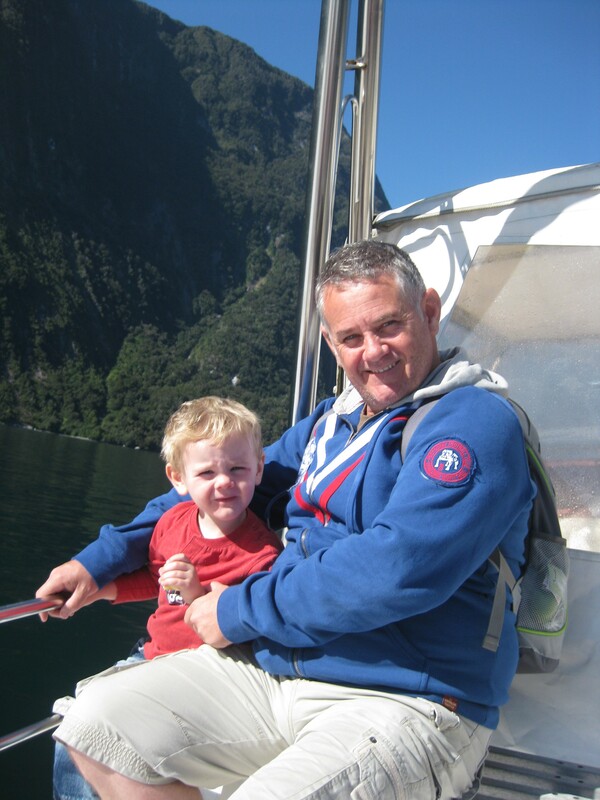 Alternatively you can do a day tour from Queenstown or Te Anau on a coach. 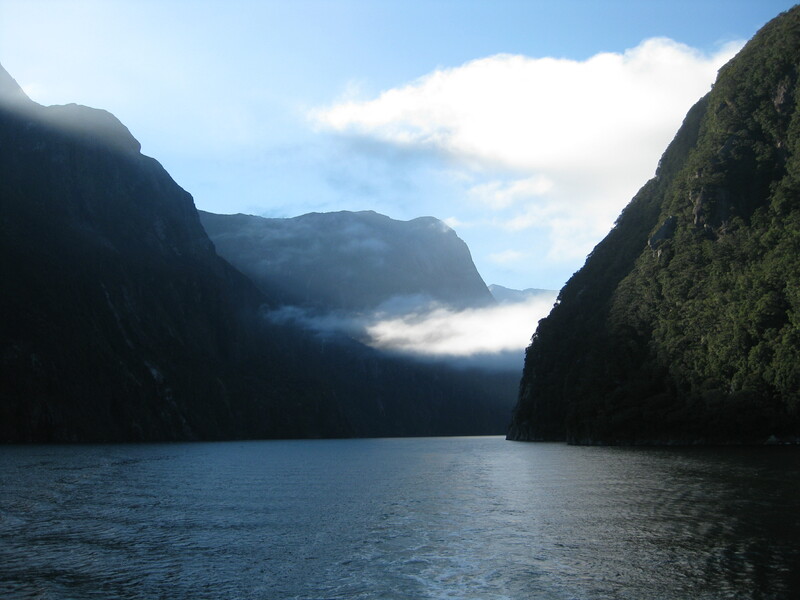 Click here to book your Fiord Day Cruise in Milford Sound. 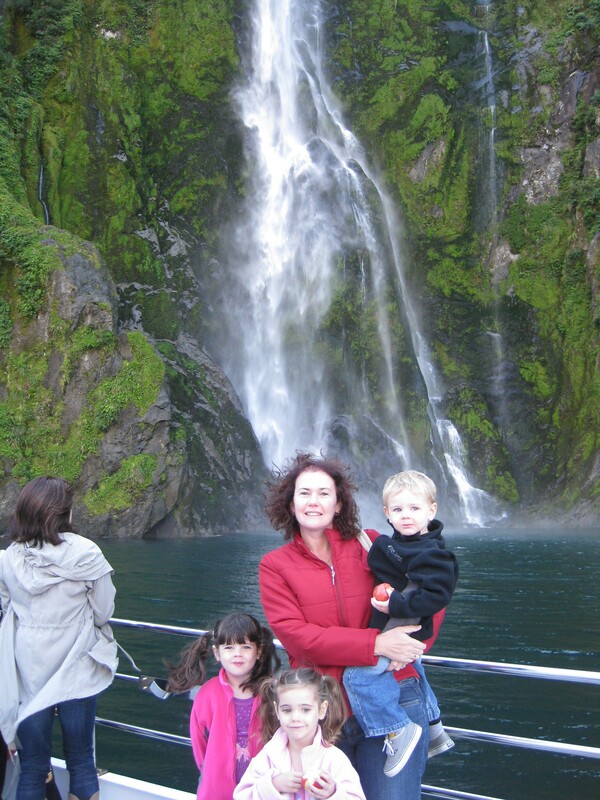 Click here to book your Milford Sound Day Tour from Queenstown or Te Anau. Both links will provide you with current up to date prices for both options. We got up, got ready and headed straight down to the dock to get our boat, it was not long after sunrise. There were a few more kids around but none as young as ours. They were very excited and keen to check out the boat. We had a quick breakfast and a hot cup of tea on board. It was in April so it was starting to cool down and Milford Sound is always a bit cooler as its on the coast and a bit damp. The kids were rugged up with beanies and jackets so they were warm enough. When the boat started we went outside to take in the views. Out on the deck with dad, look how young they are! Craig had told me how beautiful it was but I hadn’t thought it was going to be this beautiful. I was originally hesitant to take the trip, not because I didn’t want to go there but because it was a very long way and the kids were only 7, 5 and 3 years old. I wasn’t sure that they would be interested which means that we would be unable to enjoy things like you would if they were having a good time. The clouds were low and it was cold but the sun come out and it was beautiful. The boat went up to the mouth the Sound and then round the edge, the captain went really close to one of the waterfalls and the mist was covering the front of the boat. The kids thought that was fantastic, the anticipation of whether we will get wet or not kept them entertained for 30mins! We got a photo in the mist but most of the photos from that point are a bit average, it didn’t do much for my hair either! The kids were so excited about getting wet in the waterfall. We got a little wet from the mist but the kids thought it was wonderful! 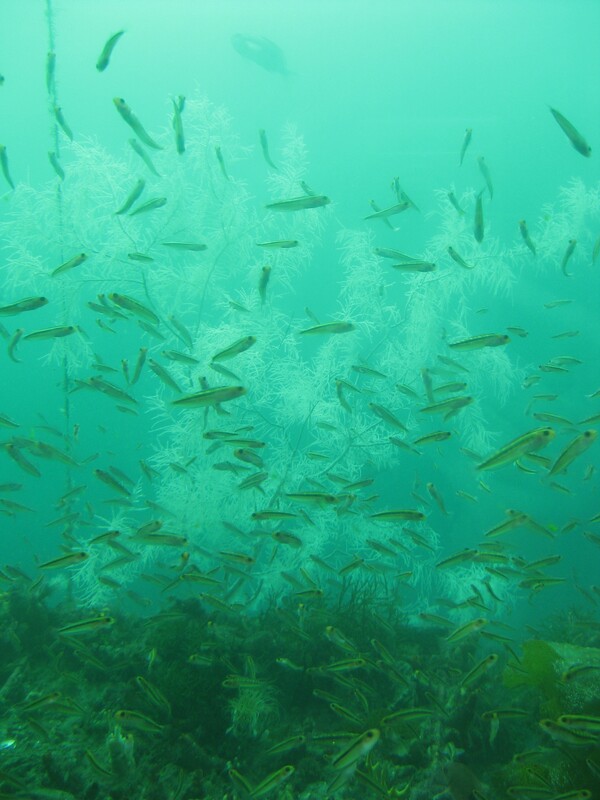 We then stopped at an underwater observatory where we were able to get off the boat and go down into the observatory and see the famous black coral, a distinctive coral so called for its black or dark brown skeleton. The windows provide you with the opportunity to watch all the fish swim by, the kids enjoyed the underwater observatory and while its not that big it did keep the kids entertained for a least an hour. Once we had a good look around we headed back up to the top to get back on the boat. The kids were keen to spot either a seal, penguin, dolphin or whale which the captain of the boat said can sometimes be seen. Unfortunately on this occasion none were to be seen, kept them busy looking though with a couple of false sightings to keep it interesting! The famous black coral that appears white! Go figure! If you look closely you can see the black skeleton of the coral. We were then transported from the cruise boat to a speed boat which took as back to the pier. The kids thought that was pretty alright too. The driver threw in a couple of turns and the little ones thought they were on the Shotover Jet! The scenery is amazing and to be out there on the water taking it all in was just as beautiful as Craig said it would be. I think it would be breathtaking to do a helicopter ride over Milford Sound one day but for the moment that will have to stay on the bucket list! My boys on the speed boat back to the pier. After we got off the boat, we picked up the car and started the long journey back to Wanaka which was nearly a 7 hour drive. The kids had an early morning so they slept for a lot of the way back which always helps. Would I do it again? Well no, if I was to do it again I would like to stay for a few nights and do some bushwalking (tramping, as the Kiwi’s call it) in the area and I would love to see a sunset from the pier. Its a very long drive to spend less than 12 hours like we did. Having said that if that was the only option I have to see it, well yes I would certainly do it again. We were there in autumn so the mountains had very little snow, I can imagine it would be stunning in spring with snow caps everywhere. The kids enjoyed the cruise for a while but soon got bored. I had some things for them to eat which filled in a bit of the time. Alannah enjoyed the underwater aquarium and the little ones loved the speed boat back to the pier. As long as you have something for them to do or eat, you will be fine. There are quite a lot of things to do on the South Island, I look forward to returning to New Zealand again soon and explore a bit more of this beautiful country.